You know that moment when your traveling with someone for the first time and you have to take out your passport for inspection at security? More often than not it's an embarrassing moment. I've yet to meet a person that reaches for their passport and says, "you've got to see this, it's my best picture yet." Although, I may try that line next time I'm running through the airport with a gorgeous male. At least it will get some sort of laugh, that is once he sees that my passport picture was taken two days after my wisdom teeth were removed and I look like I'm auditioning for a roll in Alvin and The Chipmunks. Hey, Theodore could pull a sickie and they may need a stunt double? My point here is this, passport pictures are notoriously bad. That was until Kim Kardashian decided to share a look at her new picture (if it is in fact the her real new passport photo). 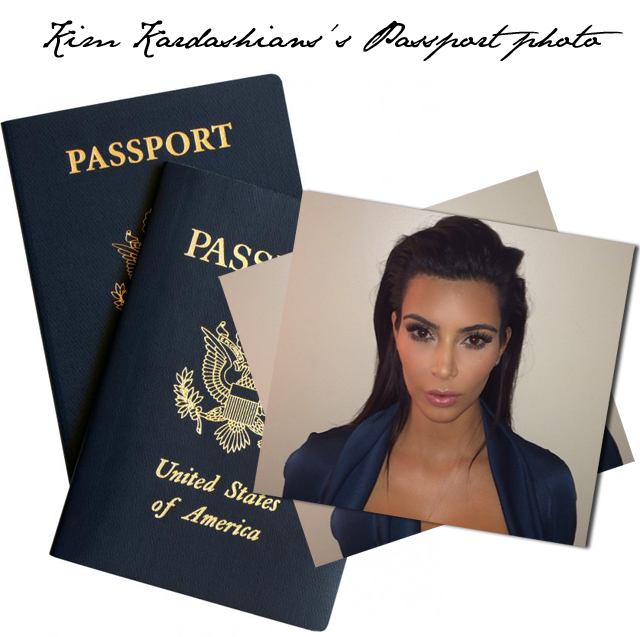 Kardashian shared the photo on instagram and wrote, "New passport pic #Mrs.West #NameChange." So, she's changing her name? Well, that's not all she's changing. She's also going to have an effect on the way women pose for their passport photos moving forward. You aren't allowed to smile or make any serious face changing poses while standing for your passport photo, but there are no rules, that I know off, that keep us all from pouting like mega-divas. Soooo trying this when my passport is up for renewal.